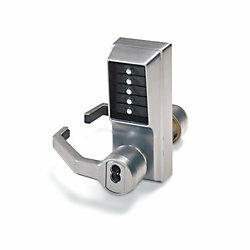 Simplex Mechanical Access Control Locks with key cylinder override. Cylinder not included. An alternative to traditional keyed locksets. Classroom/storeroom function, no code required for egress. Include ASA and standard strike. Require no batteries. Measure 9L (inside) x 3-1/8W x 3-3/16"D. Latch length is 1/2". Retrofit existing ASA 161 door preps.